This does not happen every day: a Minister of Culture publicly rejoices because a film from her country has not been awarded an Oscar. And not just one film, but two. It happened this week. Limor Livnat, still Minister of Culture in the outgoing government, told Israeli TV she was happy that Israel’s two entries for Oscars in the category of documentary films, which made it to the final four, did lose in the end. Livnat, one of the most extreme Likud members, has little chance of being included in the diminishing number of Likud ministers in the next government. Perhaps her outburst was meant to improve her prospects. Not only did she attack the two films, but she advised the semi-official foundations which finance Israeli films to exercise “voluntary self-censorship and deprive such unpatriotic films of support, thus making sure that they will not be produced at all. The documentaries in question are very different in character. All six service chiefs are harshly critical of the Israeli prime ministers and cabinet ministers of the last decades. They accuse them of incompetence, stupidity and worse. 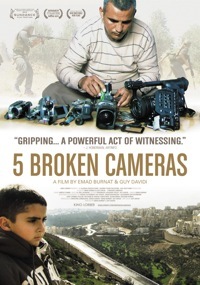 The other film, 5 Broken Cameras, tells the story of the weekly protest demonstrations against the “separation” fence in the village of Bil’in, as viewed through the cameras of one of the villagers. One may wonder how two films like these made it to the top of the Academy awards in the first place. My own (completely unproven) conjecture is that the Jewish academy members voted for their selection without actually seeing them, assuming that an Israeli film could not be un-kosher. But when the pro-Israeli lobby started a ruckus, the members actually viewed the films, shuddered, and gave the top award to Searching for Sugar Man. I have not yet had a chance to see The Gatekeepers. Because of that, I am not going to write about it. However, I have seen 5 Broken Cameras several times – both in the cinema and on the ground. Limor Livnat treated it as an “Israeli” film. But that designation is rather problematical. First of all, unlike other categories, documentaries are not listed according to nationality. So it was not, officially, “Israeli”. Second, one of its two co-producers protested vehemently against this designation. For him, this is a Palestinian film. As a matter of fact, any national designation is problematical. All the material was filmed by a Palestinian, Emad Burnat. But the co-editor, Guy Davidi, who put the filmed material into its final shape, is Israeli. Much of the financing came from Israeli foundations. So it would be fair to say that it is a Palestinian-Israeli co-production. When the last of Emad Burnat’s sons was born, he decided to buy a simple camera in order to document the stages of the boy’s growing up. He did not yet dream of documenting history. But he took his camera with him when he joined the weekly demonstrations in his village. And from then on, every week. Bil’in is a small village west of Ramallah, near the Green Line. Few people had ever heard of it before the battle. I heard of it for the first time some eight years ago, when Gush Shalom, the peace organization to which I belong, was asked to participate in a demonstration against the expropriation of some of its lands for a new settlement, Kiryat Sefer (“Town of the Book”). When we arrived there, only a few new houses were already standing. Most of the land was still covered with olive trees. In following protests, we saw the settlement grow into a large town, totally reserved for ultra-orthodox Jews, called Haredim, “those who fear (God)”. I passed through it several times, when there was no other way to reach Bil’in, and never saw a single man there who was not wearing the black attire and black hat of this community. The Haredim are not settlers per se. They do not go there for ideological reasons, but just because they need space for their huge number of offspring. The government pushes them there. What made this first demonstration memorable for me was that the village elders emphasized, in their summing-up, the importance of non-violence. At the time, non-violence was not often heard about in Palestinian parlance. Non-violence was and remains one of the outstanding qualities of the Bil’in struggle. From the first demonstration on, week after week, year after year, non-violence has been the hallmark of the protests. Another mark was the incredible inventiveness. The elders have long ago given way to the younger generation. For years, these youngsters strived to fill every single demonstration with a specific symbolic content. On one occasion, protesters were carried along in iron cages. On another, we all wore masks of Mahatma Gandhi. Once we brought with us a well-known Dutch pianist, who played Schubert on a truck in the midst of the melee. On yet another protest, the demonstrators chained themselves to the fence. At another time, a football match was played in view of the settlement. Once a year, guests are invited from all over the world for a symposium about the Palestinian struggle. The fight is mainly directed at the “Separation” Fence, which is supposed to separate between Israel and the occupied Palestinian territories. In built-up areas it is a wall, in open spaces it is a fence, protected on both sides by a broad stretch of land for patrol roads and barbed wire. The official purpose is to prevent terrorists from infiltrating into Israel and blowing themselves up here. If this were the real purpose, and were the wall built on the border, nobody could fairly object. Every state has the right to protect itself. But that is only part of the truth. In many regions, the wall/fence cuts deeply into Palestinian territory, ostensibly to protect settlements, in reality to annex land. This is the case in Bil’in. The original fence cut the village off from most of its lands, which were earmarked for the enlargement of the settlement now called Modi’in Illit (“Upper Modi’in”). The real Modi’in is an adjacent township within the Green Line. In the course of the struggle, the villagers appealed to the Israeli Supreme Court, which finally accepted part of their claim. The government was ordered to move the fence some distance nearer to the Green Line. This still leaves a lot of land for the settlement. Once Emad Burnat started to take pictures, he could not stop. Week after week he “shot” the protests, while the soldiers shot (without quotation marks) at the protesters. Tear gas and rubber-coated steel bullets were used by the military every week. Sometimes, live ammunition was deployed. Yet in all the demonstrations I witnessed, there was not a single act of violence by the protesters themselves – Palestinians, Israelis or international activists. The demonstrations usually start in the center of the village, near the mosque. When the Friday prayers end (Friday is the Muslim holy day), some of the devout join the young people waiting outside, and a march to the fence, a few kilometers away, commences. Once the melee starts, boys and youngsters – not the demonstrators themselves – on the fringes usually start to throw stones at the soldiers. It is a kind of ritual, a test of courage and manhood. For the soldiers this is a pretext for increasing the violence, hitting people and gassing them. Emad shows it all. The film shows his son grow up, from baby to schoolboy, in between the protests. It also shows Emad’s wife begging him to stop. Emad was arrested and seriously injured. One of his relatives was killed. All the organizers in the village were imprisoned again and again. So were their Israeli comrades. I testified at several of the trials in the military court, located in a large military prison camp. If the film does not do full justice to the Israeli and international protesters, that is quite understandable. The aim was to showcase the Palestinian non-violent resistance. In the course of the struggle, one of Emad’s cameras after another was broken. He is now wielding camera No. 6. This is a story of heroism, the heroic struggle of simple villagers for their lands and their country. Long after Limor Livnat will be forgotten, people will remember the Battle of Bil’in. President Barack Obama would be well advised to see this film before his forthcoming visit to Israel and Palestine. Some years ago, I was asked to make the laudatory speech at a Berlin ceremony, in which the village of Bil’in and the “Anarchists against the Wall” were decorated for their courage.